Bear Paws Guided Crystal Dig – learn about Quartz Crystal and how it can be of value. Enhance awareness of the Earth, add beauty to your garden, or make jewelry with your new found treasures! Dora will guide you throughout the entire experience. Be there to learn about proper crystal excavation techniques, the cleaning process, and the proper identification of geometric crystal formations. Discover, or rediscover, the joys of Mother Nature by enhancing your awareness and understanding of these precious stones all the while allowing your inner child to play in the dirt! · 8 A.M. ~ Meet promptly at the Ron Coleman Crystal Mine store to fill out required paperwork for entering and excavating at Ron Coleman Mining site. 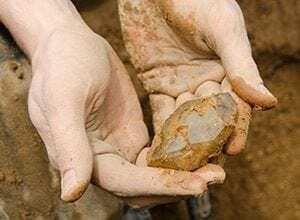 · 9 A.M. ~ Begin the morning dig, where you’ll be guided to the mounds of dark, rich dirt to look for quartz crystals for an exercise in self-reflection and meditation. Dora will be here with you for the full three hours, offering her insight and encouragement! · 12 P.M. ~ Take our findings to the water station where you will wash off your treasures, and Dora will identify the formations that make each crystal unique! · Free Time ~ After the excavation, and subsequent washing, everyone may do as they like with the remainder of their day! Feel free to have lunch, or enjoy the activities offered by the Ron Coleman Mine. You can peruse the mining store, or go on a guided mine tour where you can see huge crystal clusters close up, hear about the mine’s history, and board a huge army truck and go down into the mine itself! If you’re feeling adventurous, you can even zip high across the mine on their zip-line to enjoy a breath-taking view of the entire mine! Or you can head back to your regular life where you can enjoy the energy of your crystals, as well as their quiet & compelling call to come dig again! · Digging equipment: a simple garden trowel, gloves, kneepads or a small garden cushion, a bucket. · Clothes/shoes to play in the dirt. If it has rained, it may be muddy. A hat of your preference to shade yourself from the sun. Please remember, You will get dirty and that’s all part of the fun! · A towel, soap, an extra pair of clothes/shoes. This is in case you plan on using the showers after our excursion. Again, you will be getting dirty. · Food & Water: PLEASE bring enough food and water for yourself during your entire stay! Water is available at the Ron Coleman Mining Store, and there is a convenience store in Jessieville, which is 2.2 miles away from the mining site. 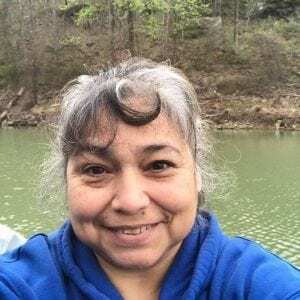 Dora Gonzalez is a native born Texan who fell in love with the Ozark Mountains and settled in the town of Fox, Arkansas over 12 years ago. During her time in Texas Dora and her family owned and operated a traveling arts and crafts business, which offered a distinct Native American style of merchandise. Shortly after moving to Arkansas Dora set aside the crafting business and began a new way of working with her hands. She is a licensed massage therapist, operating Bear Paw Massage in Mountain View, Arkansas. Then, in 2015, Dora embarked on a recreational crystal digging trip in southern Arkansas, unearthing numerous quartz crystals and reawakening her passion for creating art. 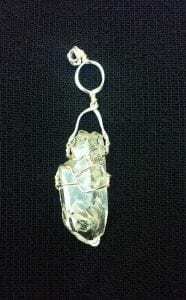 Since then she has dedicated most of her free time to turning the crystal finds into stunning wire wrapped jewelry for all to enjoy. These beautiful pieces of quartz crystal art incorporate a timeless simplicity while retaining Dora’s signature Native American style.